Canadian tech-start up launches a cool new app to improve purchasing confidence for consumers by authenticating the origin and production practices of food. BARRIE, ON, November 21, 2017 /24-7PressRelease/ — There’s a dramatic shift in consumer preference when it comes to food. The majority of Canadians are turning away from cheaper imports in favour of those produced closer to home. But with many businesses looking to cash in on local, consumers are increasingly concerned about whether such claims are true; according to recent Dalhousie-led study titled Food fraud and risk perception: Awareness in Canada and projected trust on risk mitigating agents. That’s why Barrie tech start-up FreshSpoke launched Local Food Champion, a cool new app to improve purchasing confidence for consumers by authenticating the origin and production practices of food. The Local Food Champion app is linked to the wholesale food purchase activity of participating businesses on FreshSpoke’s online marketplace. 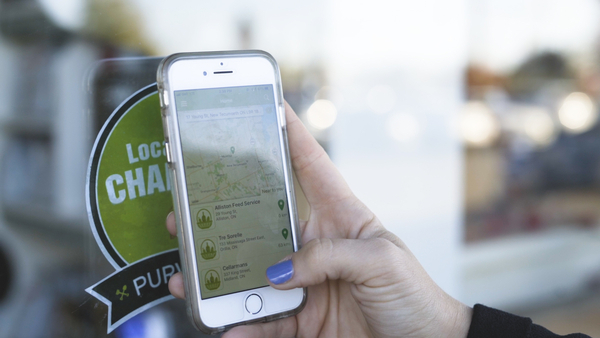 The Local Food Champion decal on a menu or door of participating retailers or restaurants signals to consumers to use the app to access real time information about the available local products, where they come from and how they are made. The product information found on the app including practices and certifications come directly from the producer, including farmers, growers, wineries, breweries or artisan food makers. “In the traditional supply chain products change hands an average of thirty times; so isolating the origin of one particular tomato or pork chop is difficult,” states Woods. “FreshSpoke’s direct to buyer wholesale model has just three touchpoints – producer, delivery driver and buyer – the distance between field and fork is much closer.” Woods points to this streamline model as the reason why Local Food Champion’s data is reliable. The Local Food Champion is now available as a free download on iTunes and Google Play. The restaurants, retailers and institutions who purchase local food on the FreshSpoke marketplace platform are featured at no cost. For more information, visit localfoodchamp.com. Canadian tech company FreshSpoke is tackling the challenge of local food distribution with a marketplace platform that simplifies order, payment and delivery for wholesale buyers and local food producers. FreshSpoke’s innovative delivery system takes advantage of excess capacity giving local food producers and other commercial drivers the ability to make extra cash delivering local food.